Having recently launched its first global music event series, “Stripes Sessions”, featuring some of the most popular electronic music acts to play in select adidas Originals Stores across the world, sportswear brand adidas Originals is bringing the party to Berlin. 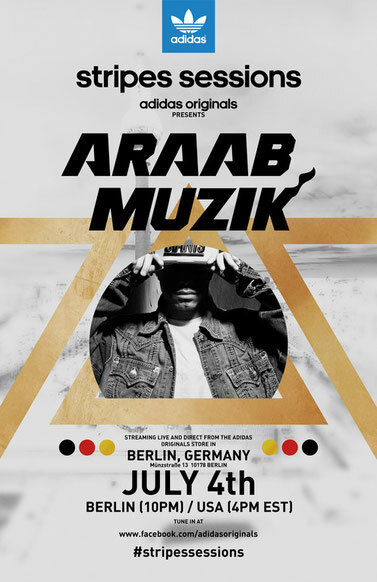 After hosting the first gig featuring Dada Life in Paris, the brand now brings AraabMuzik to the Originals Store in Berlin-Mitte on Wednesday, July 4th, 2012 with an opening set by DJ Neil Armstrong. The entire show is going to be live streamed and fans across the world can tune in at facebook.com/adidasoriginals. AraabMuzik burst onto the scene in 2011 with his unique live performances featuring the drum machine and his beats are produced with lightning quick hands on warp speed. More Stripes Sessions artists will be announced soon or you can visit the Facebook page for more information and continual updates.